Artists Steven Assael (left) and Mikel Glass (right) discuss some of Jeff Koons's Gazing Ball paintings on view at Gagosian Gallery, New York. Photo by F. Scott Hess. "Gagosian Gallery is pleased to present a new series of paintings by Jeff Koons entitled Gazing Ball." I'm basically the idea person," Jeff Koons once told an interviewer. "I'm not physically involved in the production. I don't have the necessary abilities, so I go to the top people. Having other artists make your work for you doesn't raise even an eyelash among top collectors these days. It's like saying that some top bankers should go to jail for their roles in the 2007-8 subprime mortgage crisis: it's old news and hardly anyone is interested, especially in New York. If you are hick enough to bring up any kind of objection to artists not executing their own paintings, you usually hear something along the lines of "Ah, yes that has been going on for hundreds of years: didn't Peter Paul Rubens have an army of assistants?" The answer is "Yes, he did" but with an important distinction. Rubens was fully capable of making his own paintings, and in fact was the "master" of his own studio in every respect. The popular contemporary painter Kehinde Wiley is also fully capable of executing his own canvases, but gets help from China, especially the backgrounds. Koons is truly an "Artist as CEO" who, if anything, seems to enjoy showing off the fact that skill is something he can afford. It's the current American corporate model isn't it? Fight your way to the top of the pyramid, outsource your production to capable, affordable underlings and harvest the profits. Looking one more time at the photo of Steven Assael in front of a Rubens-derived Gazing Ball paintings offers an opportunity to consider the full, weird cultural and economic bass-ackwardness of the "Artist as CEO" situation. Steven Assael, a subtle and profoundly skilled artist, stands in front of a methodically-executed copy of The Tiger Hunt by Peter Paul Rubens, a Baroque master who employed assistants to work on his paintings. Assael recognizes that the Rubens copy was executed by friends and students he has trained, but the credit goes to America's most commercially successful artist (Jeff Koons - estimated net worth $500 million) who admits that he cannot paint. Steven, by the way, can't get any closer than 2 feet away to assess the paintings as the gallery guards won't let him to close to the super-expensive work. *** Among the painters I know, skill is a hot topic. Everyone seems to intuitively know what it is -- they know it when they see it -- and the implications of having or not having skill are generating lively, fresh conversations and opinionated writing. 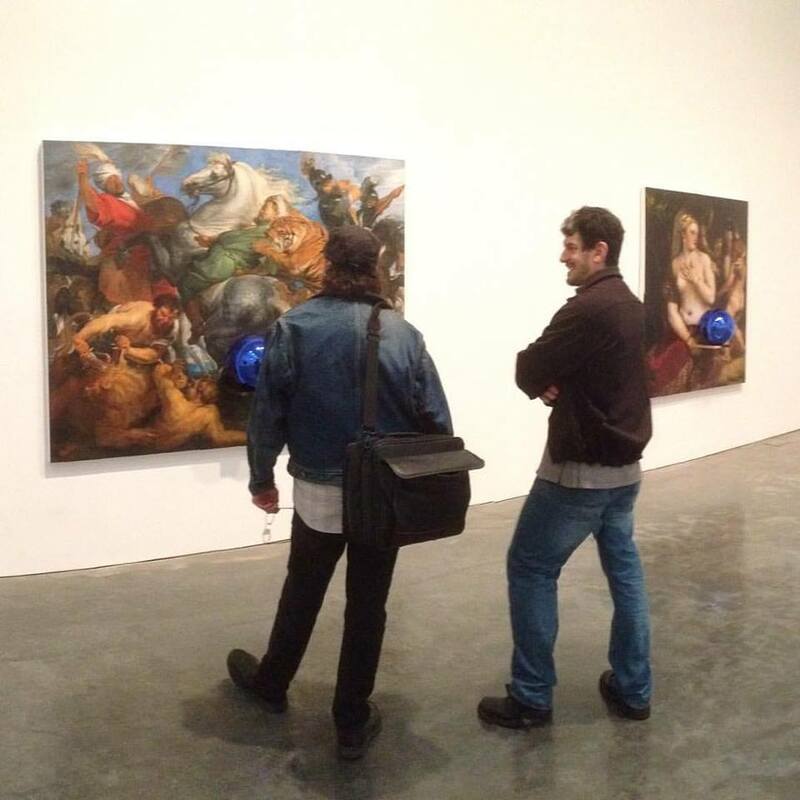 Last July when artist/educator Scott Hess -- who visited the Gazing Ball show with Steven Assael -- posted his nerve-hitting blog "Is De-Skilling Killing Your Art Education?" it quickly went viral, generating thirty thousand Facebook likes. Airing out his concerns over the current "academic prejudice against skill," Hess asserted that "only in the visual arts is training in the traditional skills of the profession systematically and often institutionally denigrated." Hess believes that the postwar dominance of Abstract Expressionism -- and later Conceptualism and Post-Modernism -- diminished the centrality of skill in art-making and generated this widespread negative bias. More recently, in a dense and thoughtful blog about the rise of "Post Contemporary" art, writer Daniel Maidman writes that "skill" is the first of three "pillars" (the others are creativity and empathy) that form the foundation of a new movement in painting that sees itself as reconstructive. "The unskilled genius may have the vision," Maidman philosophizes, "but he or she is condemned to failing it, without first acquiring the eloquence of skill." Reading Dan Maidman's words might make you anxious or angry, especially if you love modernist-derived painting and abstract painting (as I do). Isn't Modernism the period in which traditional skill -- in the seemingly ossified guise of Academic art -- was challenged and bypassed because it had become an obstacle to new forms of expression? Have we forgotten that "skill" was often used in the past to advance and justify art we might now find politically reprehensible or spiritually void? Does Maidman's warning that being "unskilled' condemns an artist to failure imply that Jackson Pollock couldn't have been a "genius" because he didn't have the "eloquence of skill?" Does "skill" simply exist in the service of realism and if so doesn't that make the idea of skill extremely constrictive? What constitutes skill in painting? In my view there is no single satisfactory answer and that some breaking down is needed. I would argue that there are two main types of skill (or skill sets) that are relevant in relation to contemporary painting. In a moment, I'm going to try to lay these out -- offering definitions that will be expanded as notes -- but first I want to make a few over-arching points. Skill, in any form, takes time and practice to develop: it needs exercise. I like the assertion Malcolm Gladwell makes in his book "Outliers: The Story of Success" that it takes 10,000 hours of practice to achieve mastery in any field and I think of skill and mastery as inter-related concepts. Skill resides in the brain but comes through the body: it has a kinesthetic dimension, and technical skill without a meaningful connection to mind and spirit is mere dexterity. Finally, I believe that the skills and skill sets I am identifying can overlap and that in contemporary painting they are frequently hybridized. In my rather accommodating view, skill isn't a static term that relates only to meanings that were fixed centuries ago. Traditional skill refers to the mastery of all the elements and methods needed to render form convincingly, accurately and beautifully. It is rooted in Renaissance ideal of "disegno" which involves both the ability to draw as well as the intellectual capacity to invent and design subject matter and compositions. Traditional rendering skills are tangible and teachable, and include the mastery of scientific perspective, the depiction of form with line and shadow and facility with the tools and materials of drawing and painting: after the 16th century this predominantly refers to oil painting. The skills of imagination and invention are nearly impossible to teach -- some of us have vast imaginative capacities and some of us are born dull -- but the concept of disegno evolved partly to acknowledge and reward the level of imaginative drive associated with genius, which during the Renaissance was a relatively new idea. The look and feel of traditionally skilled painting never stood still, as it evolved and changed in relation to new materials -- for example the introduction of new pigments -- and various masters took the whole notion of skill into new territories over time. Traditional skills constituted a kind of marvelous subtle toolbox that a few exceptional artists used with transcendent skill. In the hands of hacks these same marvelous tools gave birth to mediocre and worse works. The invention of photography in the mid-19th century mechanized enough of the magical processes of painting that skilled naturalism began to lose its hold on the public imagination. The resulting bias against realism in painting remains strong today. Idiosyncratic skill -- a category of my own invention -- refers to skills that are highly individual. They may or may not derive from traditional skill, but evolve in concert with an individual artist's personal development and in relation to his or her aesthetic goals and concerns. Even among the oeuvres of artists we think of as traditionally skilled, there instances of idiosyncratic skill: Titian's heavily-brushed late works are one prime example. Many modern artists had academic training in traditional skills which formed the foundations of their rebellious stylistic experiments. There is, for example, an exceptional knowledge of form underneath Picasso's distorted Cubist compositions, and a flair for disegno is clearly apparent in de Kooning's energetically abstracted figures. In my view, traditional skill was often hybridized in modern painting -- it morphed into idiosyncratic skill -- and the process continues to this day. I see plenty of skill in modern and contemporary painting, but it is often far removed from the "traditional skill" that key schools and ateliers are attempting to revive. Skill in modern and contemporary painting is hard to objectify and I'm sure that many would disagree with me and say that "Idiosyncratic Skill" is a valid category or concept. To them I would say this: I know it when I see it. It is there in the practice, dedication and inner-derived vision and execution of strong modern and contemporary painting. It is the ingredient that is sorely lacking in "zombified" works and I will leave it to you and your eyeballs to pick out the works in which you find skill of any kind lacking. Skill in art is no joke, and whether you like your skills traditional, idiosyncratic or both -- and I like both -- I say it is time to reward skill and let the model of artist as CEO fade. I say bring on the Post-Contemporary painting and bring on the idiosyncratically skilled painting too: down with brand names and up with individual talent. The artists who currently work for Jeff Koons are being paid as "craftsmen" for doing meticulous copying. They and others like them need the attention of the market and collectors so they can show that they are -- hopefully -- much more than that. Skill in art is no joke, and whether you like your skills traditional, idiosyncratic or both -- and I like both -- I say it is time to reward skill and let the model of artist as CEO fade. I say bring on the Post-Contemporary painting and bring on the idiosyncratically skilled painting too: down with brand names and up with individual talent. The artists who currently work for Jeff Koons are being paid as "craftsmen" for doing meticulous copying. In the universe of a CEO artist, where skill is bought and idiosyncracy is flattened and systematized, their artistic futures are being held hostage. From my point of view artists like Steven Assael (and his friends and students) look better and better to me every day... and Bernie Sanders is looking pretty good to me too.